The Colourform theme pack that HD Widgets first introduced back in February is now finished, out of beta and available on Google Play. 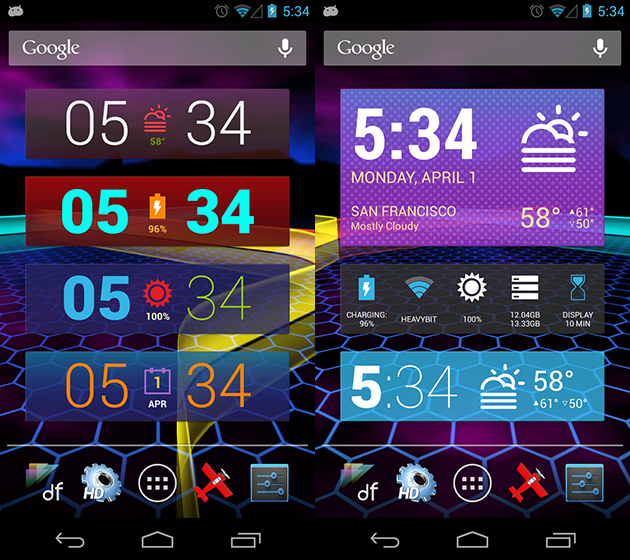 The theme pack features over 50 different widgets, all of which look like they were built specifically for Jelly Bean and Android 4.2 (think the lock screen clock). They carry a flat style, Roboto font, and the minimal design that current Android design language emits. Everything is so much cleaner in Colourform than the standard HD widgets. If you are familiar with HD Widgets, you’ll know how customizable each piece of a widget is, this is just a much simpler theme than you are probably used to. We’re no longer stuck in the 90s where themes all carried a default glossy glass texture. You can color everything from icons to text to separators to the background to individual clock items. There are now more than 50 quick settings as well, including WIFI signal strength & network name, battery level & charge, weather stats, and device storage. If you are interested in a new look, or one that matches up to stock Jelly Bean, think about Colourform.